Long before his group’s early tee time at Chambers Bay drew near Wednesday, avid golfer Greg Sutherland had to remind himself the past is the past. Over the past decade, Sutherland and a few of his Puyallup-area friends played the 18-hole University Place golf course a handful of times, including right after it opened in 2007 — and also after it played host to the 2015 U.S. Open. Sutherland never grew fond of the links-style course’s slow and bumpy fescue greens. At one point, he even vowed never to play it again. But when it came time for Chambers Bay’s public re-opening Wednesday with new poa greens, Sutherland was curious. And he was more than impressed with the improvements afterward. And by the looks of things, others are interested in the course, too. More than 140 golfers booked tee times months in advance to play Chambers Bay’s smoother putting surfaces after the course closed Oct. 1 for six months to plant and grow new sod. When the course opened in 2007, it was entirely a fine-fescue golf course, which is rarely seen anywhere outside the British Isles. 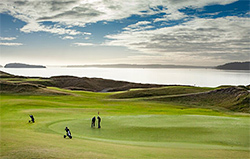 Architect Robert Trent Jones Jr. and his team insisted it was the best grass to plant for fast-and-firm conditions of links golf. But the slow-growing fescue never flourished on the greens in time for the U.S. Open. Consequently, the world’s best golfers were left to putt on bumpy, crusty surfaces rather than the smooth, bronze-colored greens USGA officials were intending. If Chambers Bay was to ever host another significant USGA tournament again — continuing with the 2021 U.S. Amateur Four-Ball Championship — the greens had to be redone. Course officials announced a greens’ grass conversion from fescue to the Northwest’s most natural grass — poa annua — would begin in 2017. The largest part of the project began last fall when the course closed to replace 15 remaining greens with more than 90,000 square feet of poa sod, delivered from Bos Sod Farms in Abbotsford, B.C. At the end of March, nearly 5½ months after the sod was laid down, Chambers Bay hosted a couple of corporate events where golfers previewed the new greens. Last Sunday, University Place touring professional Michael Putnam was invited out to play the renovated course. Seattle University held its annual men’s golf invitational at Chambers Bay on Monday and Tuesday before the public got its first glimpse of the new greens a day later. Sutherland, along with partners Jason Barta, Joel Lutterloh and Chad Lackey, were the first golfers to play it Wednesday. “I love Chambers Bay, and I could not wait to see the poa annua greens,” said Lackey, who booked the first available 7:40 a.m. tee time in early February. “They were fast and true, which is great. Allen said the only preventive maintenance course officials will incorporate for the new greens will come over the next month. “On busy days, we may cut two holes in the green, and change locations to manage (foot) traffic,” Allen said. The 18th hole at Chambers Bay golf course on Monday, Sept. 24, 2018 in University Place, Wash. shows the mottled look of the lighter, yellower perenial Poa annua grass creeping into a green that had been planted with fine fescue.